We're in the rainforest. Think Jurassic Park but take away Sam Neill (Dr. Grant), but keep his hat. Now put the hat on Jeff. We arrived on Tanna Island in early morning and had been driving through 'Jurassic Park' when the green parted into one of the most amazing sights: an ash plane, or the area of volcanic ash left behind after a volcanic eruption. We stopped the truck on the peak of one of the giant ash dunes right as the volcano burst and let out what sounded like thunder - if I were a local I don't think the surprise of visitors to their natural wonder would ever get old. Night falls around 6PM in Vanuatu so by the time the truck reached the volcanos opening (which, note: crushes ayn security measure you'd find in the U.S.) the sun had already fallen. I wouldn't have had it any other way - an erupting volcano at night is like fireworks slammed a Red Bull, took a hit of cocaine (a volcano ain't got no rules), and is constantly riding a natural adrenaline rush caused by something awesome like sky diving or running with the bulls. You can read all the National Geographics in the world and I don't care what you say, in person, it's much much better. My heart was thumping the whole time. One step forward and you're skin melts off before your body reaches something solid again. One step backward sends you rolling down the side of a very unforgiving mountain. With the wind gust being both strong and unpredictable that high up, keeping your footing was a very real concern. That night we slept in a treehouse at the base of the volcano. From the open window of the hut you could see the glow from the top and actually feel the earth rumble. "Hey Jeff," I said. "If that thing really goes off tonight I don't think our zombie escape plans will get us out of this one." JEFF, ME, AND YASUR VOLCANO. DINNER THAT NIGHT IN THE VILLAGE AT THE BASE OF THE VOLCANO - RICE AND VEGETABLES. THE SAME VIEW OF FROM BREAKFAST THE NEXT MORNING. THE VIEW OF THE VOLCANO FROM OUR HUT AT THE BASE. THE VIEW OF THE VILLAGE FROM OUR TREEHOUSE HUT. INSIDE THE TREEHOUSE HUT. 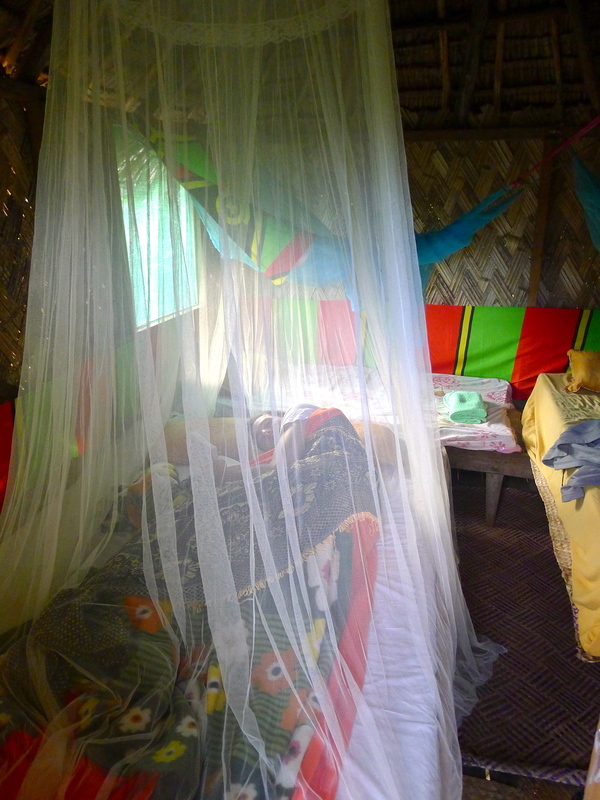 MOSQUITO NETS AND ALL.